BSO concertmaster Jonathan Carney and pianist John Nauman will perform one of the masterpieces of the French baroque, the Leclair Sonata in D with its “whirling dervishes” Tambourin movement; Copland’s Sonata, with its dual moods of reflection and rhythmic exuberance; and Beethoven’s best known sonata for violin and piano, “Kreutzer,” with its sudden shifts in mood and accent, the remarkably diverse variations of the slow movement, and seemingly perpetual motion finale! BSO Concertmaster Jonathan Carney is in his 16th season with the Baltimore Symphony Orchestra, after 12 seasons in the same position with London’s Royal Philharmonic Orchestra. 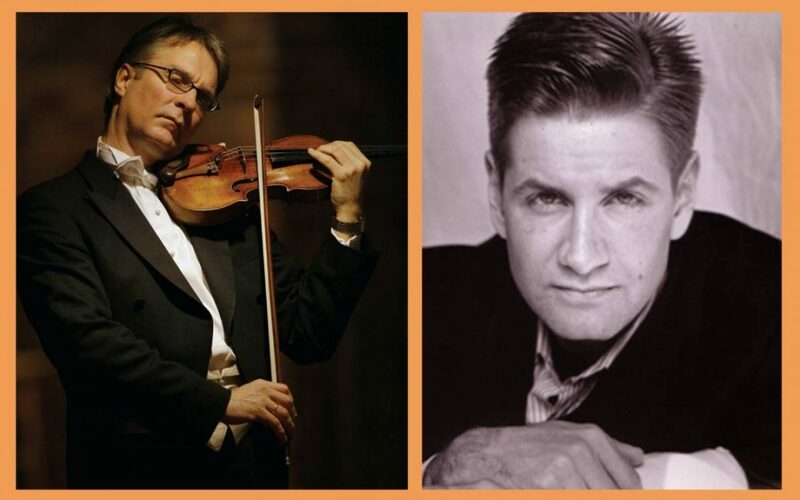 After enjoying critically acclaimed international tours as both concertmaster and soloist with numerous ensembles, Mr. Carney was invited by Vladimir Ashkenazy to become concertmaster of the Royal Philharmonic Orchestra in 1991. He was also appointed concertmaster of the Bournemouth Symphony Orchestra in 1994 and the Basque National Orchestra in 1996. Recent solo performances have included concertos by Bruch, Korngold, Khatchaturian, Sibelius, Nielsen, the Brahms Double Concerto and Vaughan Williams’ The Lark Ascending, which was featured as a live BBC broadcast from London’s Barbican Hall. He has made a number of recordings, including concertos by Mozart, Vivaldi and Nielsen, sonatas by Brahms, Beethoven and Franck, and a disc of virtuoso works of by Sarasate and Kreisler with his mother Gloria Carney as pianist. New releases include Beethoven’s Archduke and Ghost trios, the cello quintet of Schubert and a Dvorak disc with the Terzetto and four Romantic pieces for violin. Mr. Carney is passionate about music education and currently serves as Artistic Director for the Maryland Classic Youth Orchestras. He is also an artist in residence at the Baltimore School for the Arts, one of the top five performing arts high schools in the country, and also serves on its Board of Directors. Jonathan is on the faculty of the Brevard Music Center, an intensive seven-week summer music festival in the mountains of western North Carolina. As a sought after clinician he also gives master classes throughout the United States and abroad. Mr. Carney performs on a 1687 Stradivarius, the Mercur-Avery, on which he uses “Vision” strings by Thomastik-Infeld. Mr.Carney’s string sponsor is Connolly & Co., exclusive U.S. importer of Thomastik-Infeld strings. Pianist John Nauman is a native of Maryland. He held the prestigious Van Cliburn Scholarship at the Juilliard School, where he received his bachelor’s and master’s degrees. As grand-prize winner of the American Music Scholarship Association Piano Competition, Mr. Nauman received critical acclaim for his debut recital at Alice Tully Hall in Lincoln Center, New York City. In addition he has garnered top honors at international competitions including the Joanna Hodges, the Stravinsky Awards, and the Xerox Affiliate Program. He has been featured in Joseph Horowitz’s book The Ivory Trade and on ABC-TV’s “Nightline,” documenting the Eighth Van Cliburn International Piano Competition. Mr. Nauman has appeared with major orchestras including the Atlanta Symphony, the Rochester Philharmonic, the Utah Symphony, the Phoenix Symphony, the Baltimore Symphony Orchestra, the Midsummer Mozart Festival Orchestra under George Cleve, and the New Orleans Symphony led by Maxim Shostakovich. He has appeared in Europe with the Academy of London Orchestra at Saint John’s Smith Square, the Tempere Philharmonic Orchestra in Finland, and in the Davos Music Festival in Switzerland. Mr. Nauman has collaborated with Audra McDonald, Zuill Bailey, Anne Akiko Myers, Dawn Upshaw, the Takács String Quartet, and Stephen Hough. An International Steinway Artist, Mr. Nauman performed at the Metropolitan Museum of Art in New York, Tucson Chamber Orchestra,, Evenings with Steinway in Bellevue, Washington; and a tour of China. Recent recordings by Mr. Nauman include the Rachmaninoff Cello Sonata with cellist Adam Grabois (Reflex Edition) and The Piano Music of Ricky Ian Gordon (Blue Griffin Records).